Seattle artist Aaron Gustafson shot a series of large-format landscape photographs while skydiving using a custom-designed 4x5 helmet-camera. 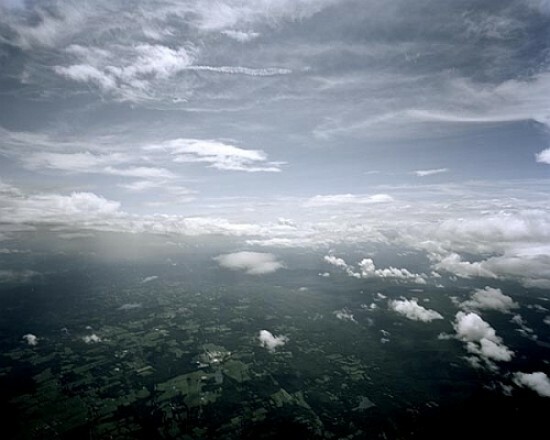 Seattle, Washington, 8 February 2010 – Seattle-based artist Aaron Gustafson recently completed a series of large-format landscape photographs that he shot while freefalling through the skies of New York and Washington State. He became the first person to take large-format photographs while skydiving. Gustafson designed a helmet-mounted 4x5-inch film camera, and during the period of several months he made one photograph per jump while skydiving at speeds greater than 130 miles per hour. Gustafson specially designed the camera that he used for the series. He made a prototype and then worked with a machinist and a plastics specialist to realize the final design. The camera is a cube-shaped acrylic and aluminum box that contains a wide-angle lens and houses a single sheet of 4x5-inch film at a time. After learning to solo skydive, Gustafson made approximately 25 photo-dedicated jumps in New York and Washington State. The photographs show expansive aerial views of the Shawangunk Ridge in New York, and the Cascade Range and Puget Sound in Washington State. Subtle blur in the images alludes to how they were made. Aaron Gustafson is a 2009 MFA graduate of Parsons The New School for Design, New York. The freefall 4x5 project was a part of his final thesis, which was shown at Arnold & Sheila Aronson Galleries, New York, in 2009. Gustafson was born in Washington State and is currently based in Seattle. Much of his work deals with man in relation to nature and challenging conventions of photography.